NASA's "Cheap" Alternative for Reaching Mars? Atomic Rockets. Pushing the future of space exploration with a blast from the past. SpaceX’s Starman mannequin took us on a trip down memory lane by blasting off in the Tesla Roadster to the music of David Bowie. Now, NASA is making its own trip back in time, to its space race days, by reviving a once-scrapped idea for an atomic rocket. Partnering with American power generation company BWXT Nuclear Energy Inc., NASA is dusting off its previously-shelved idea to build nuclear-powered rockets. First conceived under the agency’s NERVA project, these “atomic rockets” were popular during the Cold War era, when nuclear power seemed like the solution for most of the world’s problems. Unlike today’s rockets that take to the sky by burning huge amounts of fuel, atomic rockets rely on nuclear fission, or splitting — typically uranium — atoms’ nuclei to generate energy. These atomic rockets have a reactor that heats up propellants like liquid hydrogen, which expand through a nozzle in order to propel the rocket to space. While nuclear power could be more efficient, the idea fizzled out in the 1970s thanks to the potential risks, like radiation exposure. Not to mention, the uranium necessary for nuclear fission wasn’t easy to come by, and the temperatures necessary for the nuclear reaction were absurdly high (around 2,727 degrees Celsius or 4,940 degrees Fahrenheit). 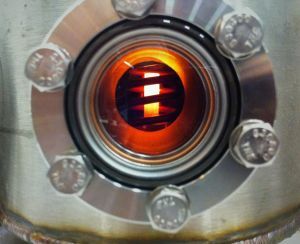 Reviving the atomic rocket project is part of NASA’s aptly-named Game Changing Development Program, which supports space technologies that could solve current issues with entirely new approaches — approaches like nuclear thermal propulsion (NTP). Indeed, NASA thinks atomic rockets and nuclear propulsion spacecraft are crucial for their plans to get to Mars. That’s because, out of all possible propulsion systems, NTP provides the fastest trip time, the agency states. An atomic rocket’s reactor also “doubles the efficiency at which the rocket uses fuel, allowing for a “drastically smaller” craft and shorter transit time,” Stephen Heister, a professor at Purdue University’s School of Aeronautics and Astronautics, told Bloomberg. In order to get NTP to work, BWXT plans on adopting and testing NASA’s designs for using a low-enriched uranium (LEU) for atomic rockets. Not only is LEU safer than highly-enriched fuel like uranium 235, but it’s easier to get a hold of. Driving down the cost of sending missions to Mars — with rockets like these that could utilize fuel more efficiently — would help humanity realize its dreams of stepping foot on the Red Planet. And NASA seems convinced that it’s necessary to explore every possible avenue to get there sooner. Certainly SpaceX has cut down the costs of space missions thanks to their reusable rocket technology. But that cost still remains high, and companies in the industry want to cut it down even further. So it’s in the space exploration community’s best interest to put as many fuel and rocket options as possible on the table. Who knows, maybe combining reusable rocket technology with nuclear thermal propulsion could get the job done. We’ve Seen Less Than One Percent of Mars. NASA’s New Lander Is Going To Change That. Is SpaceX Sending a Tesla Roadster to Mars? We’ll Believe It When We See It.